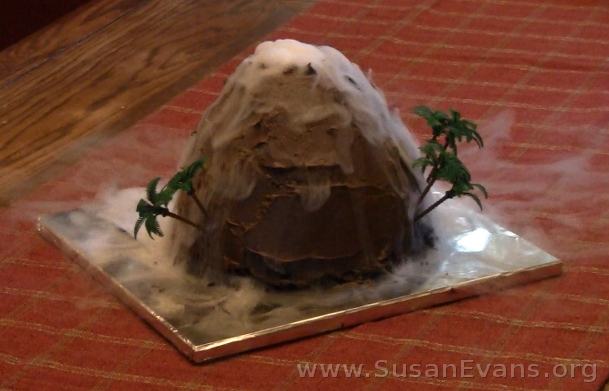 Look at this super cool dry ice volcano cake we had for my son’s natural disasters themed birthday party! 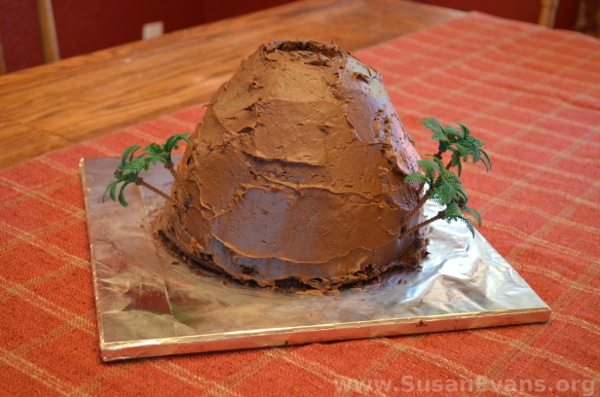 I was brainstorming different ways to make a volcano cake, and I’ve never seen this done before, so I thought it would be fun to make. I wasn’t disappointed, and it was fairly easy to make! Start by baking two cake boxes, for a total of four round cakes. Cool the cakes and place them in the fridge. Put foil on a square piece of wood or cardboard, and tape the back. Up-end one round cake onto the center of the foil. Grab a chemistry flask and cut a circle with a knife around the edge of the flask. Remove the small circle of cake, and place the flask inside. Cut circles into the other cakes, and slide them like stacking rings on top of the flask until the entire flask is hidden. 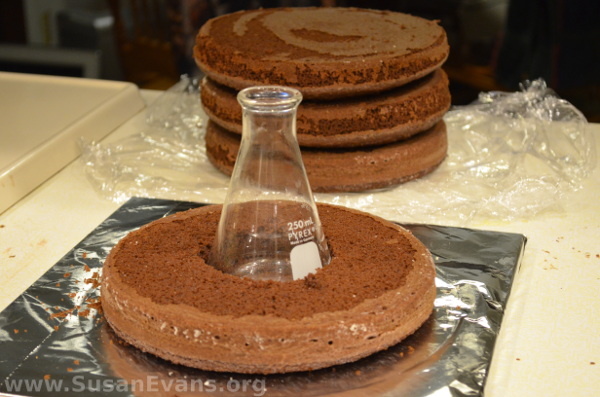 If you have a taller flask, you will have to bake more cakes. This will result in a taller volcano. 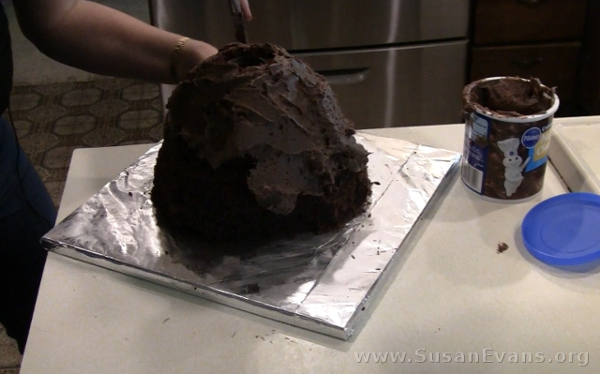 You can do whatever you want with the scraps of chocolate cake that you cut off the volcano. At this point, you want to place the cake back into the fridge before frosting it. Frost the cake with chocolate frosting, spinning the cake to get the icing to be smooth. You can cover up any mistakes you made with the icing. Feel free to poke in plastic palm trees at the bottom of your volcano to add authenticity. This was my husband’s idea, since they were left over from a Hawaiian themed party we did for my daughter years ago. You can buy plastic palm trees at a party store. Pour hot water into the volcano. Plop dry ice chunks into the volcano. (You can buy dry ice at most grocery stores, and it’s inexpensive.) Now you will see the volcano smoking downward in an incredible way! 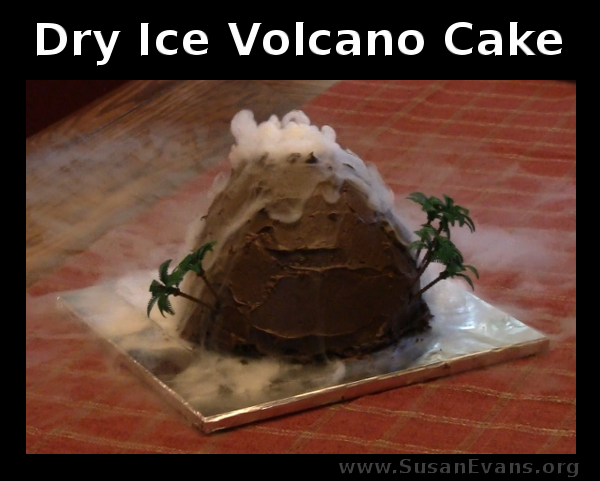 Make sure to watch the video above to see how cool this dry ice volcano cake turned out! This article contains an affiliate link. I was compensated for writing this post. I’m going to show you a short-cut on how to make your own volcano, invented by my husband. 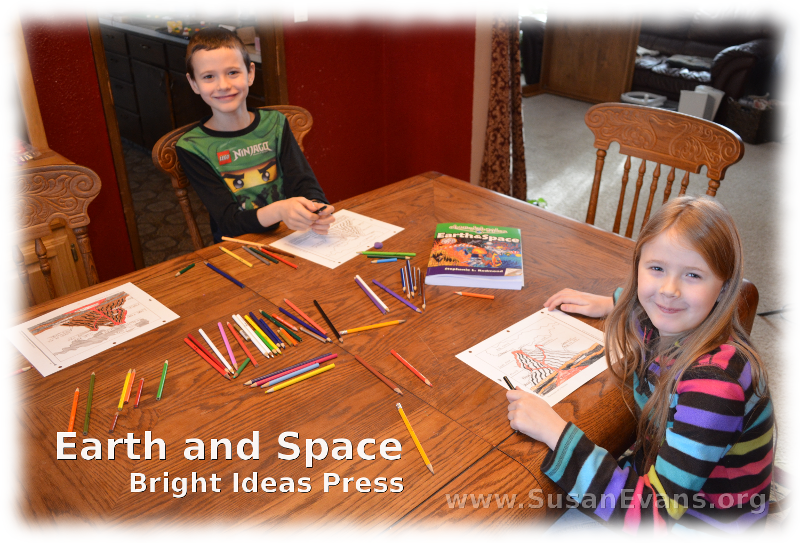 We are continuing our study of Earth and Space by Bright Ideas Press, and we are doing the volcano chapter this week. 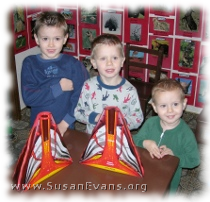 The hands-on activity is to make your own volcano, and the book tells you what ingredients you need for the eruption. But first, I wanted my kids to fill out the diagram provided in the book. One of my sons made the lava into a groovy psychedelic orange, red, and yellow design. Isn’t it cool? 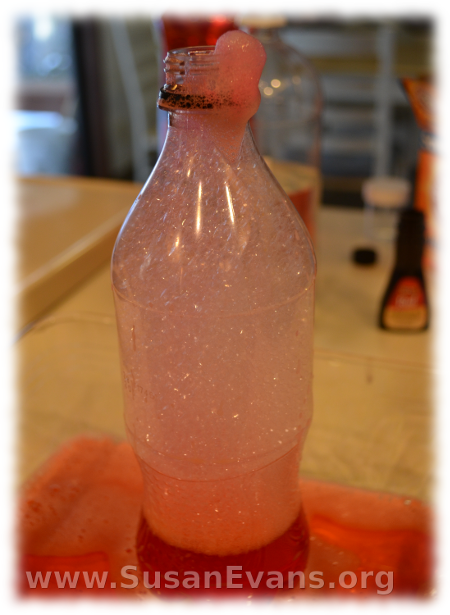 Next we experimented with the eruption itself, using an extra pop bottle. My husband didn’t seem to mind erupting it over and over, and the kids squealed with delight, as you will see in the video. 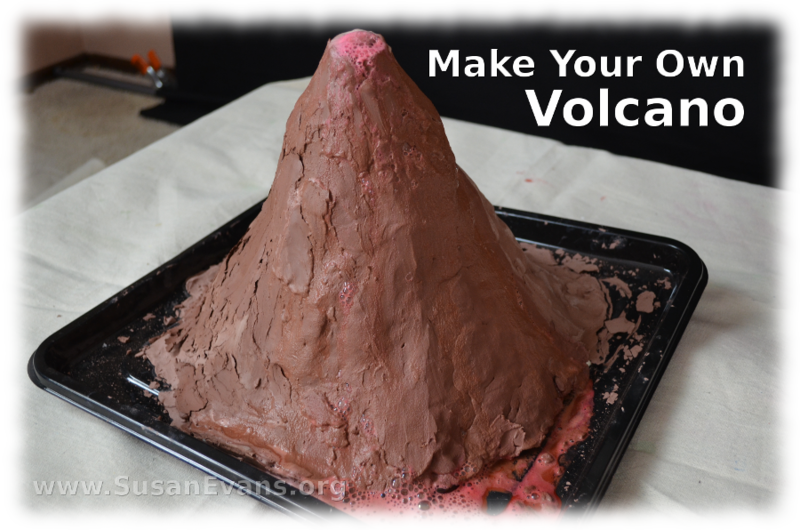 We grabbed several volcano books out of the library, and we own a volcano video, so the kids enjoyed watching lava come out of volcanoes before we erupted our volcano model. 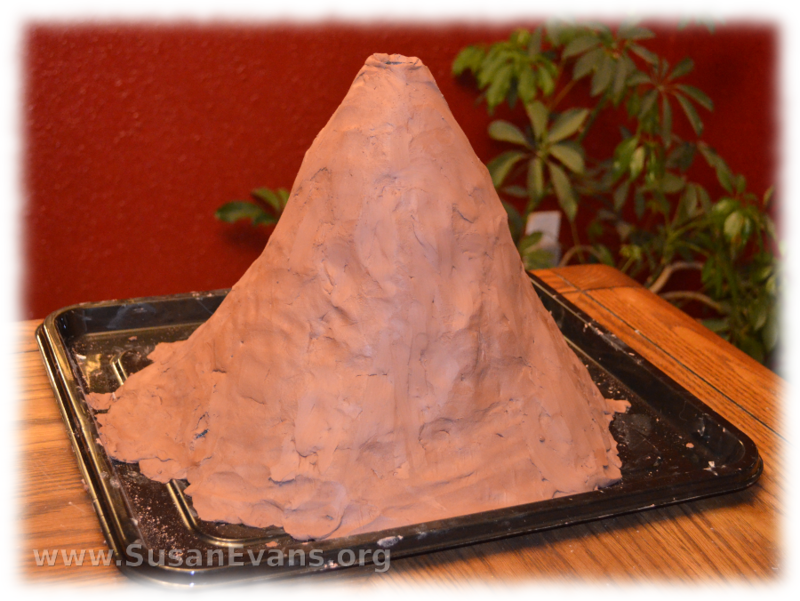 Just so you know, this version of a volcano took 5 minutes of spraying with spray foam (let it dry overnight), plus 5 minutes to chop off and hot glue the foam, plus 5 minutes to smash the terra cotta clay onto the volcano structure. So it took a total of 15 minutes. It was easy and fun. Erupting volcanoes aren’t the only reason you will want to do a vineger and baking soda experiment with your kids. If you want to see a cool, frothing explosion any time, you can add some blue food coloring to your baking soda in a small container. Stir it well. Now add the vinegar by pouring to into the baking soda, and you will see the blue froth coming out of the container in a fun way. Be sure to put a larger container underneath to catch the excess explosion so that it doesn’t stain your counter. This science experiment takes less than five minutes and is sure to impress any kid, especially young ones who have never seen it before. My own kids have erupted lots of volcanoes this way, adding red food coloring to a film canister inserted into a mud volcano outside. 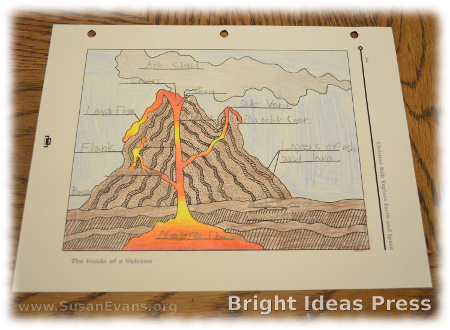 Create four different kinds of volcanoes side by side: cinder cones, composite cones, shield cones, and lava domes. Then have four kids get ready to pour vinegar into their volcano tops. Shout, “Ready, set, go!” See which volcano erupts first. You can use my Amazon affiliate link to buy a volcano model, which has a hole in the top for doing your vinegar and baking soda experiment. The model shows the inside of a volcano and is good for studying the anatomy of the volcano.